Daily dental health routines are often shorter than they should be, with tasks like flossing left out because people find it annoying. Something you might not realize is that the order in which you brush and floss is flexible. You actually don’t have to do them in a particular order as long as you do them to begin with. 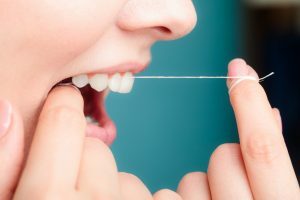 In fact, flossing before brushing has some advantages that could make flossing less of a chore. Brushing removes films, buildup, and stains, and it makes the surface of your teeth feel smooth. Flossing removes any food or loose tartar stuck between your teeth and along your gum line. The generally accepted order in which you do these is to brush first and then floss, mainly because brushing removes so much of what’s on your teeth already, and flossing cleans up the bits left behind. But it’s not that simple. If you brush before you floss, you’re missing many spots on the surface of your teeth because they’re blocked by stuck food or plaque. You might brush some of that plaque away, but you run the risk of not brushing long enough to get rid of all of it and brush the complete surface of the tooth. Another problem is that if you brush first, you could simply smear whatever’s on your teeth all over the rest of your mouth. That’s not a very appetizing thought. An option that more people have been using is to floss first. This removes much of whatever is stuck on your teeth so that when you brush, you’re not only getting to more of the surface of the teeth, you’re also not smearing anything around except your toothpaste. This may leave your mouth feeling cleaner. Another reason to try switching the order is because, let’s face it, flossing is incredibly boring. It’s not the fastest activity, and it can be kind of gross. Brushing, with its minty toothpaste, can be a much more pleasant activity just because of how it leaves your mouth feeling fresher. Get the flossing out of the way and finish with the minty toothpaste, and you could find that flossing becomes much easier to do. If you’re not sure which would work better for you, try both for a couple of weeks and monitor how your teeth and gums feel and look. Note if you seem to have more or fewer problems with morning breath, too, especially if you don’t use a mouthwash. After that, choose whichever order works best for you. This is a personal decision, so don’t worry about what others do. Contact your dentist to set up an appointment, and if you have other questions about brushing first versus flossing first, ask them at the appointment.